This book represents an authentic reproduction of the text as printed by the original publisher. While we have attempted to accurately maintain the integrity of the original work, there are sometimes problems with the original work or the micro-film from which the books were digitized. This can result in errors in reproduction. Possible imperfections include missing and blurred pages, poor pictures, markings and other reproduction issues beyond our control. Because this work is culturally important, we have made it available as part of our commitment to protecting, preserving and promoting the world's literature. ++++The below data was compiled from various identification fields in the bibliographic record of this title. 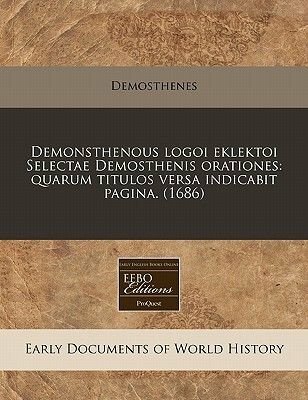 This data is provided as an additional tool in helping to insure edition identification: ++++"Demonsthenous logoi eklektoi Selectae Demosthenis orationes: quarum titulos versa indicabit pagina."Selections.Demosthenes. "In usum studiosorum hoc mode separatim excusae. "Greek text with Latin translation.202 p.Londini: Typis Eliz. Redmayne, 1686.Wing / D983Greek, Ancient (to 1453)Reproduction of the original in the Trinity College (University of Cambridge) Library++++This book represents an authentic reproduction of the text as printed by the original publisher. While we have attempted to accurately maintain the integrity of the original work, there are sometimes problems with the original work or the micro-film from which the books were digitized. This can result in errors in reproduction. Possible imperfections include missing and blurred pages, poor pictures, markings and other reproduction issues beyond our control. Because this work is culturally important, we have made it available as part of our commitment to protecting, preserving and promoting the world's literature.